Ever think of making your own stock? 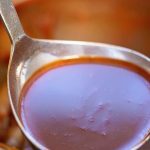 My recipe for Homemade Beef Stock adds red wine & tomato paste giving the stock a flavor that you won't get out of a box. If you are using leftover beef bones and they are already cooked omit this step. If not, preheat your oven to 375 & put the bones into a large stock pot and bake them for 45 minutes. Remove from the oven. Spread tomato paste over the bones. Add the onions, celery, carrots and garlic into the pot. Return the pot to the oven and continue baking for an additional 30 minutes. Remove it from the oven and place it on the stove on medium-high heat. Add the bay leaves, rosemary, peppercorns and salt to the stock pot. Add the wine and deglaze the pan, scraping all of the charred bits off the bottom of the pan. Add water, cover tightly and bring it to a boil. Reduce the heat, cover to vent and simmer on the stove for four hours. After four hours turn the stove off and allow the pot to cool. Once cool, strain out the bones and vegetables and discard. I recommend storing the stock in four cup containers and freeze until you're ready to use.